Good evening everybody! 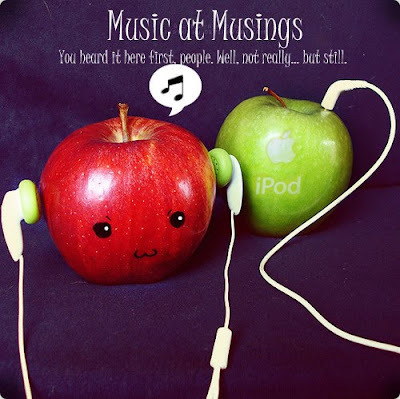 And welcome to another installment of Music at Musings! Yes, isn't it great! Fantastic! OK, shut up. Now. Good. This won't be as long as previous Music at Musings, but that's because I'm writing two ultra-special Music at Musingses! Yes, TWO! But for now, let's start! This song is one of the best of 2010. It's just so... euphoric! And my love for this song has absolutely nothing to do with the fact that Charlie McDonnell was commissioned to make the music video. No sir. I wouldn't dream of it. Although I'll really hope they'll sell the video on iTunes. I Blame Coco and Robyn make a fantastic combo. Coco's lyrics are always so beautiful and clever, they are always a pleasure to hear. Imelda May is an Irish rockabilly singer who is HUGE in Ireland. She performed at the Grammys a while back and now she has a new album, and I can't believe I didn't include her in a Music at Musings before! Johnny Got A Boom Boom was her first big hit. So here it is. And stuff. (As I have said before, Hot Press will be knocking on my door any day now...) ONE MORE THING - I love the fact that she always has the blond twirly thingymajiggy in her hair. OK. Watch the video now. I know I keep spamming Musings with Sons of Admirals music, but I just can't help it! They're so talented, and handsome, and talented, and handsome! Anyway... Indigo is such a beautiful song. It's now one of my favourite love songs, even though it might not seem like a love song, but it is! And it's just so gorgeous! My cousin and I have different opinions on The Script. She thinks that all their songs sound the same and are about the same thing. I believe that The Script are truly one of the greatest bands of the western world. In a recent interview, Danny Donoghue, the lead singer, said that when they returned to their homes in Dublin from touring around the world, almost all of their friends had lost their jobs due to the recession, and that you can't just go up to them and say 'Hey, I've toured with Paul McCartney!' 'It's all about going back to basics, drinking cheap wine, eating your dinner off the floor. That's when you meet each other for the first time, when you have nothing.' AND ANOTHER THING - Taylor Swift is a big fan of The Script. So there. And that's all we have time for! Don't forget, we'll (me and my laptop) be coming back shortly (at the weekend) with lots of posts, and perhaps a video? The rest, as usual, I will listen to when everyone else has gone to bed, which is looking like never because my dear darling father is watching an old man rambling about gunpowder. Also, Charlie love, SoA love...Imelda May love? Oh why not, I'm feeling the love tonight. PS you can see how populated my house has been that I haven't even watched the latest CISCL (confusing acronyms ftw) video.